"…customers can take comfort in the knowledge that the partner ecosystem will be there to support them. Note that I said the 'ecosystem' – I did not say the specific partners. A vibrant partner ecosystem allows the mix of partners to change over time to meet the ever changing needs of the customer." This is in reference to Microsoft, but it applies to the Document Imaging ecosystem as well. Hardware manufacturers, ISVs, VARs, Office Equipment Dealers and Systems Integrators all sit in the ecosystem, and can all benefit from working together. But rarely do the ecosystem pieces remain static at a customer. MFP vendors change on a regular basis as leases expire. New software applications are consistently being rolled out. And the VARs, dealers and SIs that sell and support these systems change with them. In the Microsoft world, Microsoft sits at the center of the ecosystem as the glue. Choose to work with Microsoft, and you also get the benefit of working with their ecosystem. With Document Imaging, that glue is an open platform that lets any scanning device (MFPs and scanners) connect to any software application. Add some Xerox devices to a Canon environment? – no problem. Decide to roll-out SharePoint to supplement OnBase and Documentum? No need to change how you handle the problem of getting paper into those systems. Ecosystems are an essential ingredient in delivering customer-focused solutions. And they help drive standards. And, they present revenue opportunities for all the partners involved. It’s no wonder that Microsoft spends so much money on building theirs! I’ve been spending some time lately putting together before and after workflow diagrams of some of our customer implementations and had an interesting realization. It seems that too often we get laser focused on how many steps are reduced in a “before and after” solution. And we believe that a reduction in steps from 9 to 7 is not as good as a reduction from 9 to 6. What I am realizing is that this may not always be the case with document imaging. 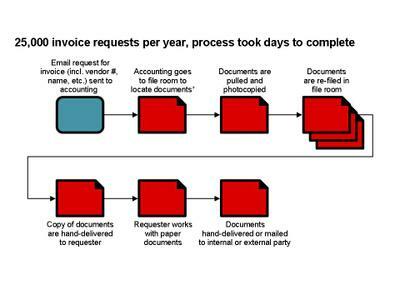 With document imaging, the workflow improvements come from the reduction of paper, and the resulting manual processes. Yes, there may be a reduction in steps as well. But, in some cases, there may actually be steps added as more electronic systems are touched. However, there is always a reduction in the time spent on steps, since working with electronic information is vastly quicker than working with paper. 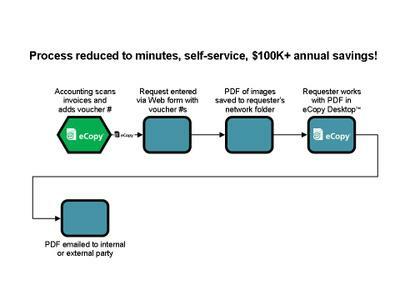 Not surprisingly, the workflows that showed the biggest improvements in time spent (and therefore $$) were the ones that moved the scanning process closest to the beginning of the workflow. With document imaging, it’s not a complicated message -- the earlier that paper is eliminated, the more efficient the remainder of the workflow is. The UK national newspaper The Guardian posted an article today in its education section about a high school that helped pay for its students' laptops by implementing a paperless office strategy through MFP document imaging. The savings came from eliminating the cost of distributing paper documents. The article can be read by clicking here. You know that when a national, daily newspaper starts writing about MFP document imaging, the topic is beginning to be popular. I generally try to avoid talking about eCopy specific information in this blog, but wanted to put in a quick plug for our annual conference, the eCopy Paper Connection Forum. It’s a unique event in the industry, as we gather hundreds of representatives from office equipment manufacturers, independent software vendors and office equipment resellers all in the same location to network, learn about document imaging, and help each other succeed. And this year, for the first time, we’re inviting end users to participate in the event and get a chance to meet with all of the different companies that make up the office document ecosystem and learn how they can improve their document workflows. So, mark your calendars for October 6-9, 2008 for the event in Boston. And please tell us what is important for you to hear at the event -- we’re working on the agenda now and we welcome your input!